Soft Exoskeleton Market size valued at USD 765 thousand in 2018 and will witness 28% CAGR up to 2025. 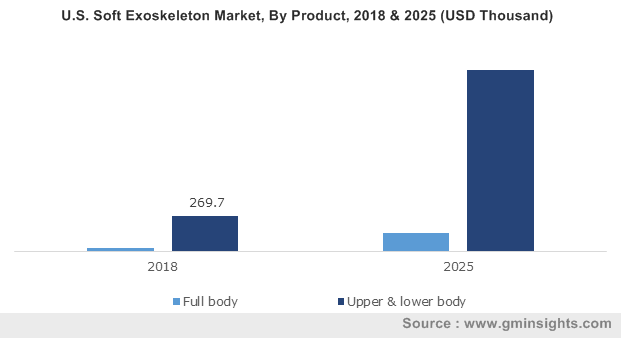 Increasing product demand for application in healthcare centres and industrial facilities along with the high incident rate of gait disorders are driving the soft exoskeletons market share over the forecast timeframe. Low cost of the exosuits, and the capability of wearing the suit underneath clothing are among the prominent attributes expected to provide significant consumer inclination towards these products. Increasing adoption of exosuits for healthcare applications is attributed to the rising physical disabilities from diseases such as multiple sclerosis and Parkinson’s disease. Proliferating hospitals and medical centres offering improved rehabilitation therapy procedures including gait training for paralytic patients will support the industry proliferation till 2025. Additionally, recovery from injuries including spinal cord, strokes, and traumatic brain injuries supports the soft exoskeleton market expansion over the forecast timeframe. Soft exoskeletons offer a wide variety of benefits compared to the rigid exoskeletons including construction from flexible materials, that utilizes bowden cables, air muscles, and filaments for easier body movement. Moreover, easier wearing of the suit along with custom fitting and compatibility with distinct body shapes and sizes are strengthening the soft exoskeleton market growth through 2025. Development of lightweight actuation platforms that applies controlled forces to the person wearing the suit along with multiple anchoring points equipped in the garment supports in overall minimization of the suit mass. Additionally, the distal mass attached to the wearer is significantly reduced through flexible transmissions and proximally mounted actuation systems transmitting power to the body joints. Innovative sensor systems incorporated into the soft exoskeletons for measuring human kinematics and suit-human interaction forces. Multiple sensors including gyroscope, inertial measurement unit, and pressure sensors among others are used for offering compliant, cost effective, robust solutions, further expanding the soft exoskeleton market share. Industry participants along with research institutes are continuously investing in R&D to introduce innovative soft exoskeleton solutions for catering to a wide range of customers. For instance, in 2018, Harvard John A. Paulson School of Engineering and Wyss Institute for Biologically Inspired Engineering collaborated to develop machine-learning algorithm for creating personalized exosuits. Continuous innovations for the effective utilization will present strong growth landscape for soft exoskeleton market share over the forecast period. Government regulations and standards are expected to provide strong support to the overall industry growth. For instance, in 2017, American Society for Testing and Materials formed a Committee F48 for addressing concerns related to the design & manufacturing, maintenance & disposal, human factors & ergonomics, security & information technology, and task performance & environmental considerations. These standards will enable industry participants to focus on improving quality and offer low cost innovative solutions, further propelling the soft exoskeleton market size over the projected timeframe. Rising application of full body soft exoskeleton in industrial applications to improve productivity, reduce stress and fatigue will positively influence product demand over the forecast period. Full-body wearable soft exosuits offer diverse flexibilities owing to the absence of external metal frame. Moreover, superior protection with improved service and client support to individuals will provide strong growth prospects for the soft exoskeleton market size. Higher complexities associated with permanent knee and leg replacements along with the availability of wide range of customizable exoskeletons at varied price range are driving the soft exoskeletons market growth. Enhanced degree of freedom offered by the system with usage of efficient motors and actuators, and materials for operating the exosuits, are boosting the soft exoskeleton industry growth till 2025. Utilization of exosuits for military application ease the physical stress on an individual for improved performance in combat operations and mission effectiveness. Additional benefits include lower weight, enhanced strength, and improved degrees of flexibility support the increased product adoption for military applications. Existing geo-political differences across the economies, specifically in the U.S. and Russia will drive the investments in soft exoskeleton market. Increasing military budget allocations by several governments across the globe will provide positive outlook for the industry growth. For instance, the U.S. Senate approved a military budget of around USD 716 billion for upgrading their existing equipment and acquiring newer equipment for assisting their missions, thereby providing positive prospects for the soft exoskeleton market growth. U.S. held largest soft exoskeleton market share owing to the increasing investments in wearable exosuits for geriatric population. Growing number of spinal cord injuries in the U.S. will further support the augmentation of the regional share. For instance, in 2018, according to the National Spinal Cord Injury Statistical Center, spinal cord injuries accounts for around 17,700 cases every year, thereby providing positive outlook for the industry growth. Moreover, defence agencies, such as DARPA, are significantly emphasizing on the development of soft exosuits, thereby alleviating the industry demand. Increasing investments in R&D for improving the exoskeleton technology will present strong growth opportunities for soft exoskeleton market in Europe. Growing geriatric population and increasing investments in the product development in the region are expected to be among the prominent factors. Industry participants are engaged in collaborating with research institutes and universities for developing lightweight exosuits at lower cost. For instance, researchers from the University of Limerick are collaborating with the Italian Institute of Technology for developing commercially viable exoskeletons by 2019. 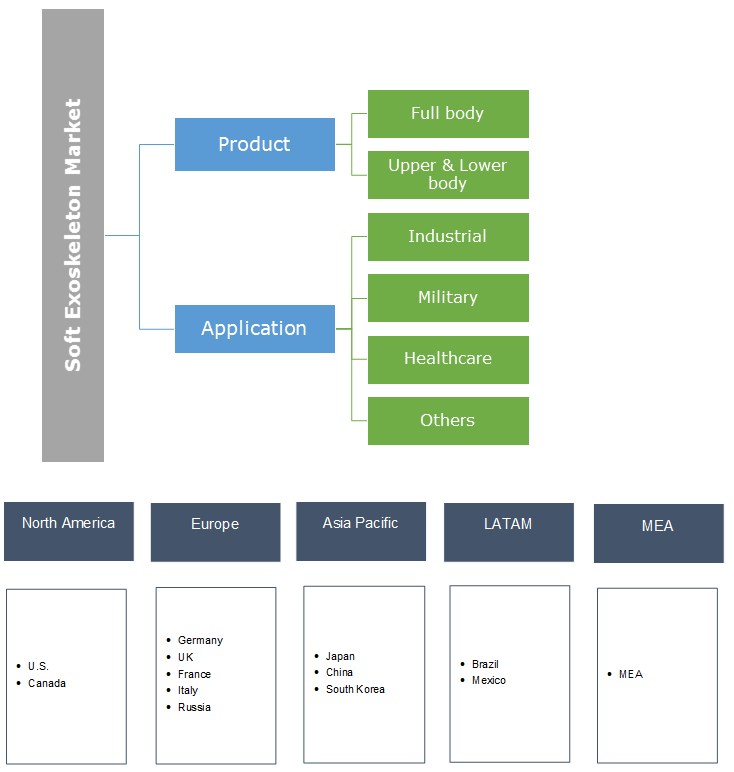 Roam Robotics, Bioservo Technologies AB, and Daiya Industry are among the major industry participants in the soft exoskeleton market size. Other significant industry participants include Ekso Bionics, ReWalk Robotics, Defence Science and Technology Organization (DSTO), Gogoa, Harvard Biodesign Lab, Otherlab Orthotics and SRI International. Product innovation and portfolio expansion will be the key strategies for industry players to enhance their market share over the forecast period. Industry players are constantly focusing on enhancing their production facilities and upgrading their solutions to differentiate their services from competitors. For instance, in December 2015, Daiya Industry introduced a renting solution for pneumatic Power Assist Glove. This strategy enabled the company to enter into soft exoskeleton market space with first commercial product. Competitive pricing is a detrimental factor expected to impact the proliferation of industry participants in the soft exoskeleton market share. The key cost optimization initiatives adopted by manufacturers include continuous optimization & upgrade of their products, conducting trials, and expanding their retail and distribution network. Additionally, manufacturers are reducing the complexity of their products as means of controlling their product cost. Integrating passive structure to perform operations can augment significant cost reduction. For instance, in August 2018, Rostec Corporation demonstrated their operational exosuit that can enhance the military assault and march capabilities.